Most golf tips rendered today by experts concern driving. These tips are to guide players in hitting the ball further than they normally do. The first and the most important step in driving is to set it up like any other swing shot. Driving could make or break the hole. Set up the swing properly. 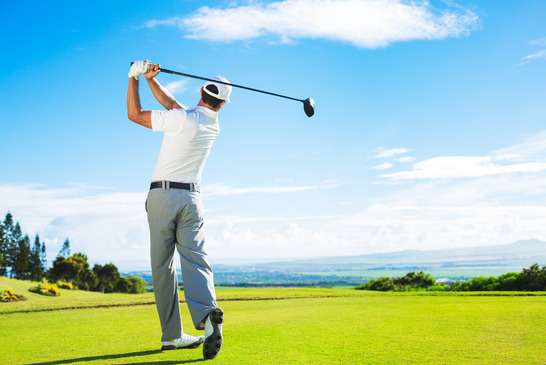 Driving should be done, using a wood or a driving iron due to their length. The length gives you two distinct advantages - you can increase the distance of your stance from the ball and you can spread your feet wider to get a better balance and weight transfer. This will enable you to get a short and wide swing giving you control and power in the right proportions. Sequence of setting up, swinging and driving with the correct weight transfer is a major factor. Although a little difficult for the beginners, they could keep it in mind and keep their drives in the sequence, so that they can develop their game on these fundamentals. Power should build with your swing. Always release the power along with the impact with the ball. Keep the swing short, the longer the swing, the lesser the control. Most beginning golfers tend to think otherwise in the attempt to hit the ball farthest. Short and wide swing will give you most powerful and controlled shot compare to the long and narrow one. Never swing too back or too forward. Stay within your self, to keep it in control. Distribute your weight evenly from heel to toe and stay balanced. Maintain good posture, a straight spine and upright chin. This will not only help in your drives but also to avoid injuries. Imagine that the ball is in the middle of the fairway. Use a correct wrist hinge and full body turn to get the maximum from your swing. This will give you more consistent driving skills. .. in addition .. step on it .. In addition to the above, maintaining fitness of your body is a major factor to gain yards on the swing. Certain exercises are said to add almost 30 odd yards to the drive, so step on it.